Everybody has bad times. Everybody just hits that rough patch you cannot get past, you think. And everyone needs a little inspiration sometimes. It is amazing what a little reminder of how others have moved past their obstacles can help cheer someone (including yourself) up. 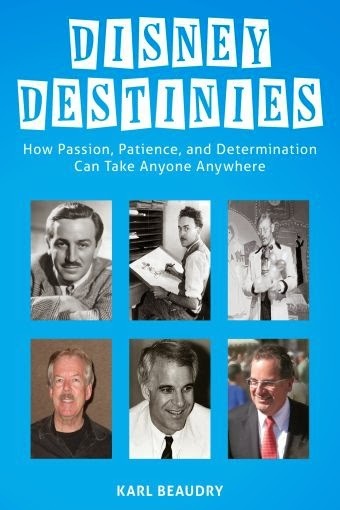 Disney Destinies: How Passing, Patience and Determination Can Take Anyone Anywhere by Karl Beaudry recounts stories of Disney personalities and legends who experienced tough times and moved past them. Beaudry starts with the big cheese himself, Walt Disney, reminding us of his setbacks including a bankruptcy and detractors who mocked his ideas. Along with Walt Disney, Beaudry profiles Disney figures that you are likely aware of like Bob Gurr, Tony Baxter, Ward Kimball and more. But he also spends time with lesser discussed figures like Vesey Walker, Owen Pope, and a surprise Disney personality Steve Martin. The typical chapter is not a full biography but a look at specific incidents that the individual had to struggle with to become the success they later became. I can see someone picking this up and believing it is a book of biographies like Walt Disney's Imagineering Legends. Disney Destinies is not really a history book, it is an inspirational text. I think an alternative name, in jest only, would be Chicken Soup for the Disney Fan's Soul (it does not appear such a book exists). In this book the inspiration is not provided through moral tales or fables, but through the real-life stories of people that Disney fans will likely know or come to relate to by the end of the profile. Why inspiration? Beaudry makes it clear that he was reading a lot of Disney history during a rough patch in his life and found inspiration from the stories he was reading. In short, he is now sharing what inspired him when he was undergoing a personal struggle. Beaudry succeeds in sharing this inspiration by providing easy to read text with smooth connections between the story and where the individual could claim success. Though I will admit with me being a history fan there were still insights I pulled out of the book. I did not realize how the lose of Roger Broggie's father as a young child put him on the path towards his later career. And I did find the thoughts on Steve Martin's career, including his job at Disneyland as a youth before the magic shop and his long years as a stand-up without success as a story of perseverance. And I had never really thought about the fact that the Popes relocated their entire lives to Disney property from the Studio to Disneyland to Walt Disney World throughout the decades to support Walt Disney's dream. I could see giving this book to a Disney fan facing a personal struggle since they will connect to the profiled figures. I could also see giving this book to a young adult just starting to dig into Disney history since there are a number of individuals that they will be introduced to who will come up again in their reading. I would probably not suggest this to someone who wanted an in-depth history of the Walt Disney Company, as this is not the book's purpose. With a Kindle version priced at $4.99 it would be an easy book to give to a Disney minded friend who needs inspiration. Everyone struggles sometimes and everyone needs some inspiration. As Karl Beaudry points out there are no real dead-end jobs. There are only steps in one's story. Disney Destinies reminds us that even those we admire faced difficulties in their lives. And like them we can overcome them.